Raising the minimum wage will have severe consequences, especially for those working in the restaurant industry, investor rating service Moody’s warned on Thursday. The increased cost of labor will likely cause higher costs to customers, which as Fahy noted, would be bad for restaurants trying to maintain profits. The restaurant industry tends to have a low profit margin, so a decrease in the flow of customers could be severe. Restaurants could also cut hours or the number of employees they have while relying more on computers to service customers. Some restaurants may even be forced to close. The Moody’s report also showed the minimum wage doesn’t even have to go up to $15 an hour for negative effects to occur. For instance, if the minimum wage went to $10.10 from the current $7.25 an hour margins, casual dining could fall around two points. Despite the possible negative outcomes, many groups have argued that increasing the minimum wage will help more than it hurts. One such group is Fight for $15. From rallies to media marketing campaigns, Fight for $15 has led much of the effort to raise the minimum wage in the past year. Though claiming to be a grassroots workers movement, evidence has shown the group is a front for the Service Employees International Union (SEIU). Some have even accused the union, with video evidence, of paying people to be protesters. 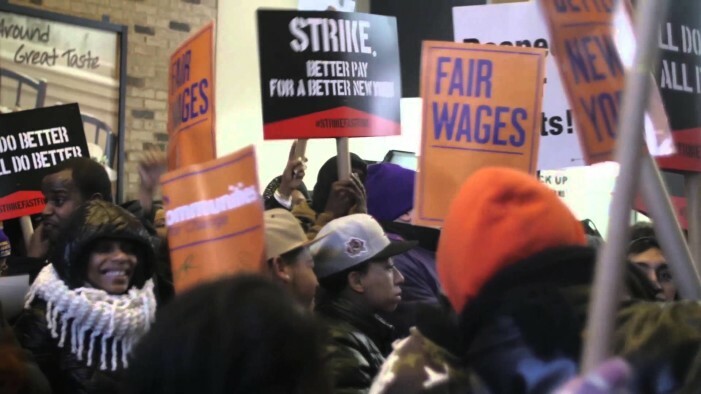 The SEIU has been criticized by some, like Worker Center Watch (WCW), for using the Fight for $15 protests as a way of bypassing labor laws to more easily unionize fast food workers. Additionally, acco$rding to a report from Union Facts, a minimum wage increase would benefit the SEIU directly while hurting non-unionized SEIU competitors. Seattle and San Francisco, which led the way in passing a $15 minimum wage, have already seen some businesses have to close because of the increased cost of labor. Nonprofits in Los Angeles, the most recent city to pass a $15 minimum wage, also have reported problems as well. Even after McDonald’s agreed to raise wages back in April, organized labor was quick to want more.